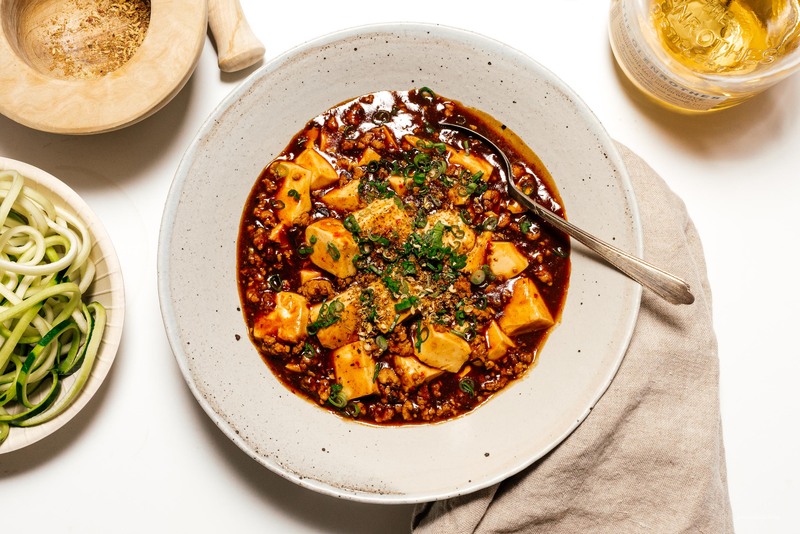 Making authentic mapo tofu —soft, silken tofu in a spicy Sichuan chili pork sauce— at home is easier than you think. I’m addicted to the magical combination of silky soft tofu and saucy spicy pork. If you’re in the know, you know what I’m talking about: mapo tofu. The famous Sichuan tofu dish that has plenty of mala, the signature numbing spiciness of good Sichuan food. If you haven’t had Sichuan food before, you might be scared of it’s fire-y red color, but once you get past that fear of heat, you’ll be coming back for more, more, more. I never used to love spicy food, but I’ve always, always loved tofu. As a kid, it would be on the menu two, sometimes even three times a week. Partially because we all loved it, but mostly it was because my brother was a tofu addict. He would beg my mom to cook tofu for him. He didn’t even care how it was made, he just had to have tofu. It was one of those funny things that all of our family friends knew about. They even teased him, telling him that his future wife would have to be a tofu maker. Spoiler: sadly, my sister-in-law is not an artisanal tofu maker. But, she likes tofu too, and in particular, mapo tofu. 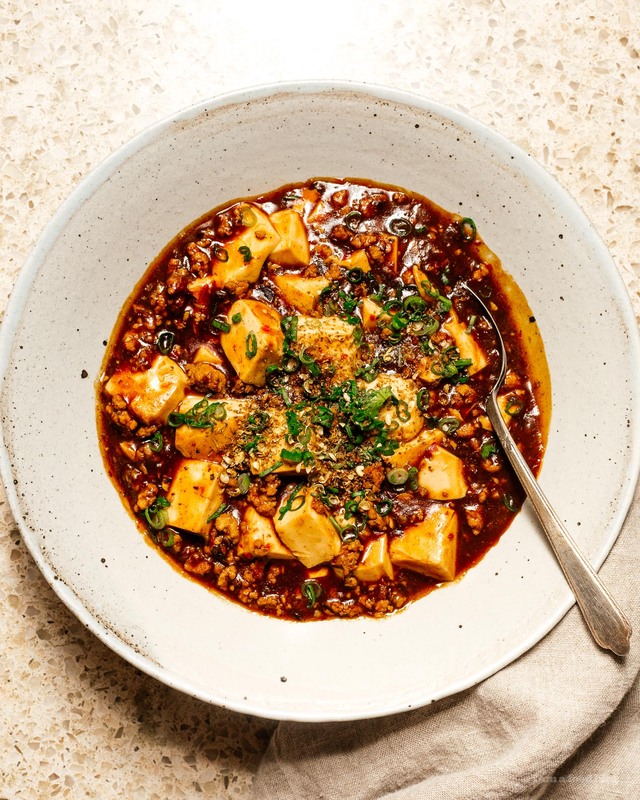 If you love tofu and you love spicy, you’re going to love mapo tofu too. 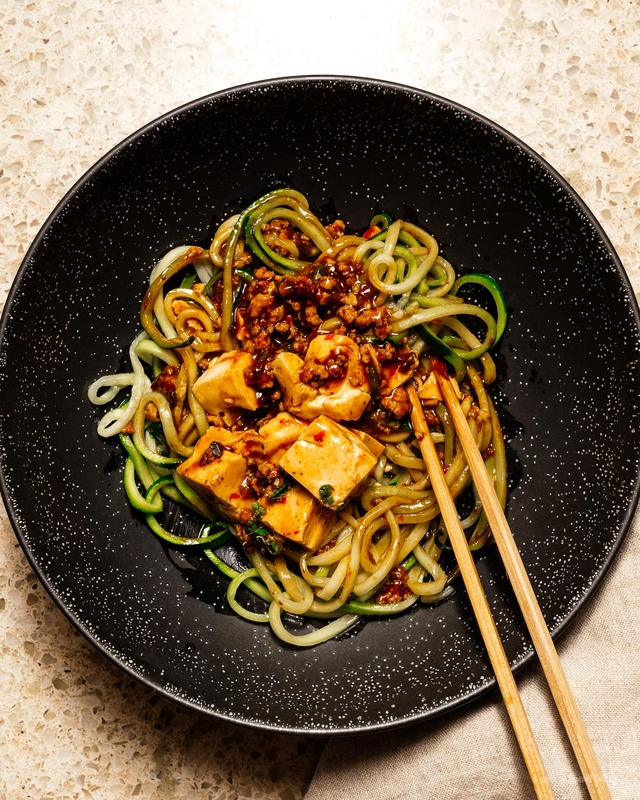 And, if you’re not so big on spicy, the good thing about this dish is that you can adjust the spiciness level by altering how big of a pinch of Sichuan pepper you finish it with. There are two key ingredients to this tofu: chili bean paste (doubanjiang) and Sichuan peppercorns. You can find both of them at your local Asian grocery store. 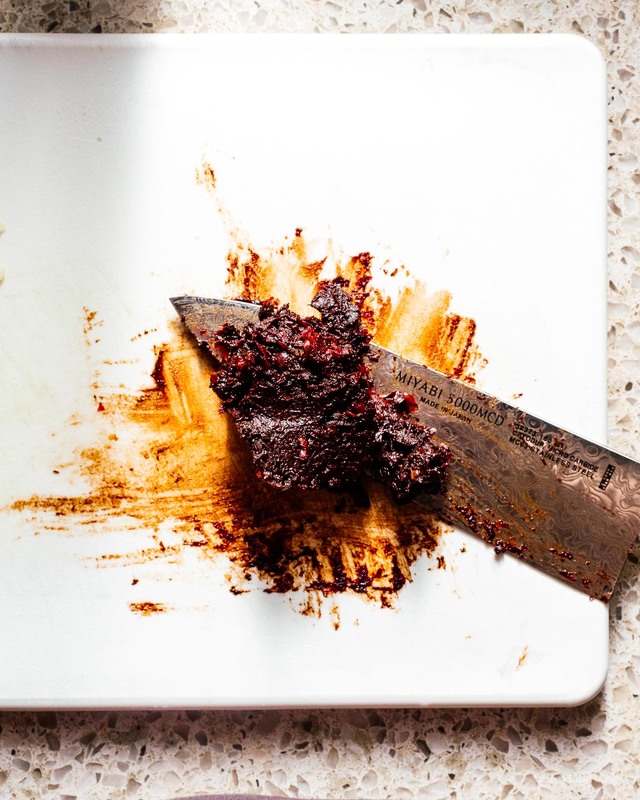 In regards to the Sichuan peppercorns, you can buy pre-ground Sichuan peppercorn powder, or, if they’re available, go for the whole peppercorns and toast and grind them yourself. The spice will be much more fresh and apparent if you do. Sichuan peppercorns are pretty straightforward, but doubanjiang is another thing. Sometimes, with authentic recipes, there’s that one ingredient that you have to search far and wide for. You’ll be searching the aisles wondering, is this worth it? I’m here to tell you that it is! Doubanjiang is a spicy fermented mix of soy and broad beans. 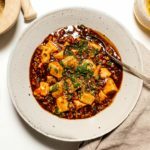 It’s been called the soul of Sichuan cooking and it’s what will give your mapo tofu that glorious red hue. When shopping, you want to look for the Pixian (an area in China) variety if you can. It’s kind of like how, if you can, you want to buy champagne from the Champagne region in France. But, like champagne, if you can only find sparkling wine, don’t sweat it, Lee Kum Kee also sells a serviceable easier to find Cantonese style doubanjiang that they call chili bean sauce/toban djan. Once you have your ingredients in hand, it’s a pretty simple recipe. You start off by blanching your tofu in salty water – this helps season it as well as firm up slightly. Then, it’s just a question of frying the pork and doubanjiang, adding some chicken stock and thickening it up. 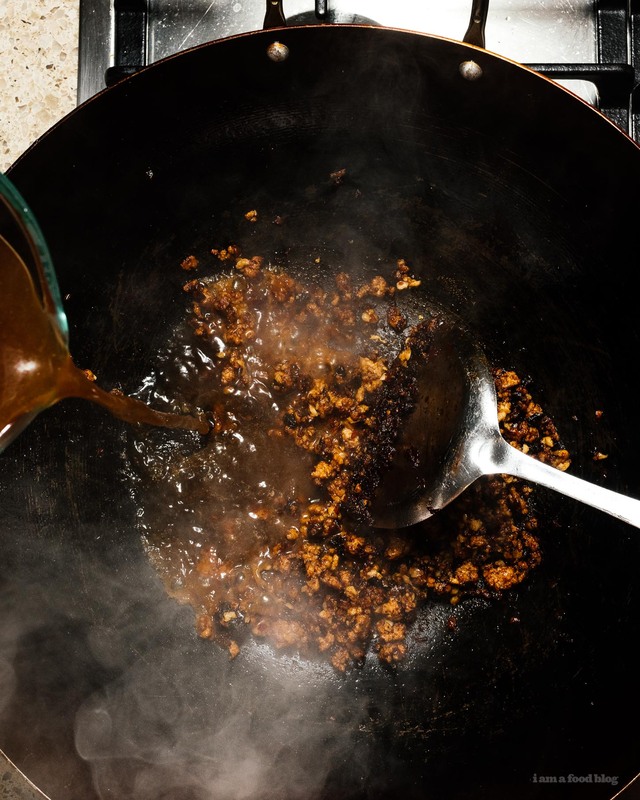 Frying the doubanjiang and releasing the oils is what makes everything super tasty and fragrant. 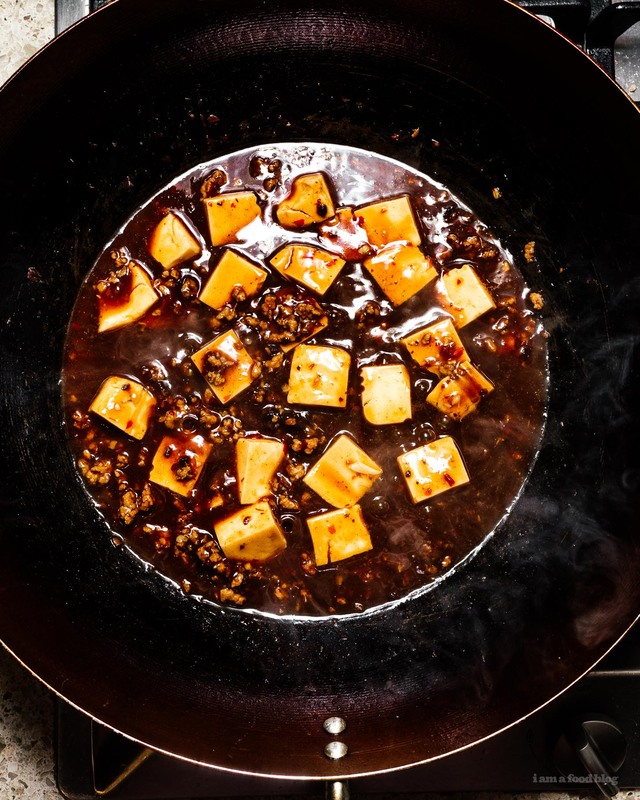 The sauce gets a bit of thickening up with cornstarch and everything is glossy and golden and clings perfectly to your tofu cubes. It’s a match made in heaven for fluffy white rice. Or, if you’re on a kind of sort of diet like me, zoodles! Happy mapo tofu-ing! I hope you get a chance to try this one out because it’s a good one. Once you do it once (and have all the ingredients in your pantry) it becomes a very simple easy, weeknight dinner. You can even make it without the pork if you’re vegetarian. Tastes good on zoodles too! Cut the tofu into small cubes and set aside. Bring a pot of water to a boil and add a pinch of salt. Turn the heat down to a simmer then add the tofu and cook for 2 minutes. Remove from the heat and let soak in the salted water while you prepare the rest of the dish. In a wok, heat up the oil over medium heat. Add the pork and cook, breaking up, until the fat renders out and the pork is cooked through. Turn down the heat and add the doubanjiang and cook, stirring, until the oils release from the doubanjiang and everything looks bright red. Stir in the garlic and cook for 1 minute. Add the stock and soy sauce and bring the heat up so everything comes up to a simmer. Drain the tofu and add it to the wok, pushing it around gently so you don’t break it. Stir in the cornstarch slurry and bring up to a gentle simmer, until the sauce is thick and glossy, about 1 minute. Turn off the heat and scoop the tofu with sauce into a serving dish. Finish with a sprinkle of ground Sichuan peppercorn and sliced green onions. Enjoy with fluffy white rice or carb of choice. I love tofu. I am always looking for inspirational recipes. Thanks for sharing. That looks very flavorful. I don’t often have tofu, but that looks really good.